Hidden gun safes – Which is best? Proper gun storage requires that all firearms be locked in a safe or secured in a cabinet. While this keeps your guns safe, it has the potential to block your access to the firearms in a crisis situation. 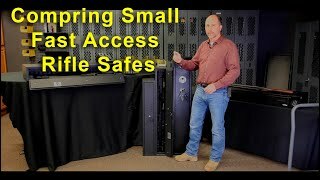 Here we compare 3 popular products on the market that each tries to address the issue of secure storage vs. fast access: the AMSEC gun safe, BARSKA Biometric gun safe, and the SECUREIT Fast Box Hidden Gun Safe. BARSKA: Quick Access Biometric Rifle Safe-While it is not advertised as a hidden gun safe, it can be placed in a closet. This is a small vertical-only gun safe, available on Amazon for $279. The BARSKA simply fails and what it says it will do. The box depth is less than 6”. This severely limits the type of rifles you can store. The BARSKA will not store an AR15 or any rifle or shotgun with a pistol grip. Any rifle with a scope will also not fit. Your only option is to carefully place the rifle sideways in the safe and lean it against the back. In this scenario, the scope is hitting the safe’s metal wall and the capacity has been drastically reduced from the stated 4 guns to just 1 gun. We were very disappointed in the BARSKA. It simply does not do what it claims. BARSKA shows an image on their site of a safe with the door open and an AR 15 inside. This is deceptive and misleading as the door could not be closed and locked. AMSEC Home Defense VaultThis is a horizontal (under a bed) hidden gun safe, available on Amazon for $399. The AMSEC is an under bed gun safe with a drawer system. It is a very well-made all-steel welded construction. It is designed specifically to mount underneath a bed. What you notice right away when opening the safe, is that the lock mechanism is loud. The lock beeps and opening the lock bar makes a loud “clank”. This safe drawer, where the firearm sits, is 43” long. While that will store most tactical shotguns or an AR15, you may struggle to fit more traditional shotguns. Anything over 43” will not fit. The AMSEC can only be used in a horizontal under the bed configuration. This is a one-dimensional product. The position and type of lock make this impossible to open quickly in an emergency situation. You will have to get out of bed, down on all fours in the dark and try to open the lock. It may be difficult to see and the loud beeping from the lock can give away your position to an intruder, putting your safety at a much greater risk. The Fast Box hidden gun safe is available in two sizes (Model 40: 40” long / Model 47: 47” long) allowing unlimited uses in key location according to your firearm type and storage needs. Both Fast Box models can be used in either a horizontal or vertical orientation. The Model 40 is designed for tactical weapons and small shotguns where space is limited. The Model 47 will hold any rifle or shotgun up to 46 1/2” long. At 13” deep, the Fast Box will hold rifles and shotguns with optics and magazines. Vertically, there is room for 2 rifles, a few handguns, and extra ammunition. Right away you notice the lock makes virtually no noise and opening the box is fast and quiet. Construction is rock solid, the box was designed to meet DOD AR190-11 and OPNAV 5313-c military security requirements. The basic model (model 47) includes hardware to mount to a steel bed frame (no drilling required). There are mounting holes in the top and bottom to allow bolting to wood frames or to the floor. The vertical kit consists of two cradles and one base unit (stores two firearms). Fast Boxes are also compatible with most CraddelGrid accessories so you can easily add storage for handguns, ammo or other valuables. With the purchase of the quick release tie-down strap kit ($9.95), the gun safes can be used in mobile vehicle applications. The Model 40 is primarily used for Law Enforcement mobile applications and includes the quick release tie-down straps. Fast Box Hidden Gun Safes can be bolted together in a locker format if you have multiple firearms you want to be locked and stored together. This application style is popular among SWAT teams and other rapid response security force units. All 3 safes were well made. The BARSKA fails at a very basic level. I do not think it was designed by a gun owner since it will not store what it claims it can store and it would be difficult to hide. The AMSEC is a solid under-the-bed hidden gun safe for long guns under 43”, however, it does not allow for fast access and is too loud when unlocking. The FAST BOX provides secure and hidden storage of the widest variety of firearms and is the only product that offers quiet fast access in a crisis situation. The ability to adapt to vertical or horizontal applications is also unique and makes the SecureIt Fast Box adaptable to almost any situation – vertical, horizontal, and mobile. When you compare the facts it’s easy to see why the SecureIt Fast Box is the market leader in small fast access and hidden gun safes. SecureIt is also the only company that offers a “Buy-It-Back” Guarantee. Firearms should be locked when not in use. All 3 of these products will achieve this at some level but we believe the Fast Box wins in every comparison. Regardless of what gun safe you use, the number one take away here is – All firearms must be locked. Please be responsible. How high is the FAST safe from the bottom of the safe to the top of the door? Thank you for your question. So, if you have your Fast Box set up in a vertical application – it’s roughly 39.5″ for the Fast Box Model 40 and roughly 46.5″ for the Fast Box Model 47 when measuring from the bottom of the unit to the top of the door. If you’re laying the unit flat – it’s about 5.75″ for both the Model 40 and Model 47. Can you lag bolt this to a wall? Thank you for your question. Yes, you can mount a SecureIt Fast Box to the wall with a .25″ or 5/16th of an inch lag bolt. Please keep in mind, though, that the Fast Box product line does not come with the hardware needed to do this. Thank you for the note. I have fixed the page and the video now displays correctly. Sorry for the error, not sure what happened… I deleted and re-posted the video link and not it works. We will not be at the Sacramento show this weekend. We are currently setting up for SHOT show in Las Vegas. Do you anticipate making this with a mechanical lock? At this time we are not working on a mechanical push button lock for the fast box. You can simply remove the battery which disables the electronic lock and use the Key lock only. This is a mechanical lock. Can you confirm if it has the single grid or dual grid wall panel in the back of the safe? The video shows it has two louvers, but some photos shows it only has one. The Fast box has 2 rows of louvers. It will hold 2 rifles or shotguns vertically. What size screw or bolts does the safe use to attached multiple units together or to bolt it into the floor? I have searched everywhere on your website to see if your products are made in the USA. I assumed given your work for the US Military that they must be made in the USA. But the lack of any identification where your products are made makes me think they are made elsewhere. I prefer to buy Made in the USA whenever possible. Can you please clarify: are you using US made steel? Are these made in a US plant? Any insight is appreciated. The Model 52 is currently made in China. Our plan as we have stated from the beginning of the Agile line development: build market awareness of the product grow sales, move Mfg to the US. Low production manufacturing in the US is extremely expensive. When the sales volume reaches the tipping point we will move production to the US. Sales are growing and we are looking at building a production line for this product. Simply stated, we are a small company and there was no way we could start this product in the US. We made the decision to go to China for the first few years of production. Manufacturing these in China is a real pain in the neck. The quality is excellent but the logistics of dealing with China is tough. We look forward to US production. Im a big fan of the SecureIt products and would have purchased one had these been available when I purchased my amsec under-the-bed safe, you should acknowledge that the audible “beeping” from the lock buttons can be shut off and put in silent mode. Obviously it is only intended to be used in a horizontal fashion – generally adviertized for under your bed but it is too fat to actually fit under my bed so it sits out in easy view and takes up a lot of floor spac. Istill highly recommend it but make sure you measure your bed height before buying if thats where you plan to store it. Hello, I was very impressed with the video and just have one question. Is the Fast Box in any way fire rated for the home? It wasn’t mentioned in the video. Thanks. The Fast box does not have a fire rating. None of the cabinets in this comparison have a fire rating. The purpose of the Fast Box is to give you quiet access to a defensive firearm in the event o a crisis. If you live in a city, town or village, call your fire department and ask them whqt the response time is to your address. In many cases, it is under5 minutes. The question then is, do you need a fire rating for any gun cabinets? Ok, ok, ok…. Ok, Howdy guys, Your fast box is a good item for its purpose. But, what about an end opening box. Here goes. It has to fit under the left rear seat of a Ford F-150 Super Crew, with the seat down, as if passengers were there. The box would open on the end (when the truck door is open) so you could slide the drawer out to retrieve your AR W/20rd mag inserted and extra 30rd mag lying beside forend. AR with scope or other optic (like an EOTech w/magnifier) and a Streamlight TLR w/laser (bottom rail). The door would be a little recessed to prevent prying. Folded or rolled edges on the end o the box to prevent injury from sharp edges. The box would mount with a bracket bolted to the floor of the truck (of course no wider than the box so the bolts are not exposed) that would then receive a raised tab on the bottom rear of the box that slides into the bracket. The box would the be secured by a bolt or bolts accessible when the door is opened and drawer removed. The drawer would need a stop (that could be manually released) to prevent pulling it out too far and dumping your rifle. The lock, (and this is just a suggestion, you might have a better idea) is a battery operated key pad, with an RFID circuit that bypasses the keypad, like the Hornady safes, you wear an RFID bracelet or key fob, and of course a key lock if the battery goes south. The idea hear is to always have your AR available, and be able to get to it quickly without raising up the seat, if you have cargo back their that would have to be off loaded first, or passengers you don’t want to wait for to exit the truck to get the seat up if you had a top or side opening box. And you could walk away from the truck without worrying about your rifle being accessible evil doers. In case you had to pee or go into a bank. Whatdoyathink, huh? Wow what an idea! We love a good idea here at SecureIt and encourage our customers to reach out to our product development team! Please email stephen@secureittactical.com to submit your idea. Thank you for your interest and support!